GREAT DANE: NOT a Mastiff ! According to the Genetic Structure of the Purebred Domestic Dog analysis (which you can read here) the Great Dane is not a mastiff-type breed! Instead, the Great Dane is (surprise, surprise) a Hunting breed. 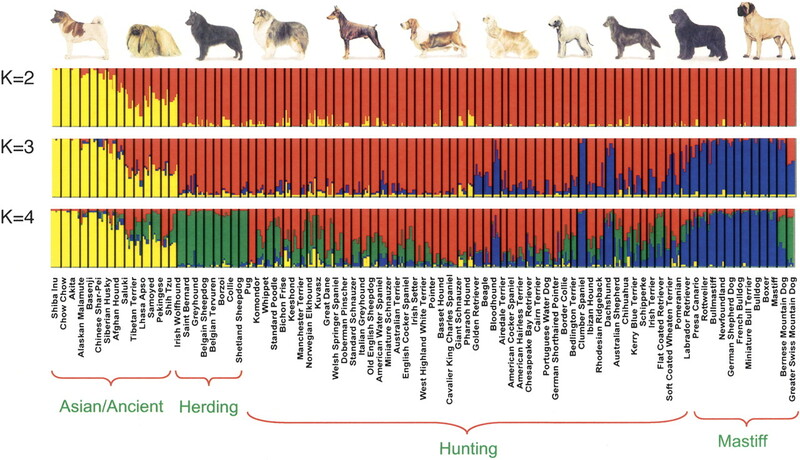 You can see the structure analysis figure (it’s a cool graphic) here and the Canine Genome paper, where it’s included, here. And you will notice something – the Great Dane is nowhere near the mastiff breeds: not surprising, for some of us, I guess. We already knew this – from the old standards, that said: neither a mastiff nor a greyhound but in the middle between the two extremes. Now, these studies didn’t come out yesterday – the UCLA study is from 2010, the Canine Genome was published in 2005 and the History and Relationships of Dog Breeds in 2004. More than ten years ago. and look where the Great Dane is. Smack in the middle. Neither a mastiff nor a sighthound but in the middle between the two. So I drew these lines to show you, on the chart, ’cause it’s such a cool way to visualize it. Now, since we have this scientific information for quite some years now, and the DNA has revealed to us, unequivocally, where our breed is, among all the others, isn’t it about time the FCI classification was revised accordingly ? Isn’t it about time to correct this error ? The DNA doesn’t lie ! So, no excuses no more: we know, for certain, as we have it from a good source – the best – from the dogs’ own DNA, that the Great Dane is NOT a Mastiff. We have it from numerous scientific studies, and is unquestionable and irrefutable. It’s a fact, folks! The FCI classification of the Great Dane breed among the mastiffs in the Group II, is incorrect. Our breed is not related to them, morphologically, historically or genetically. The FCI classification is supposed to group related breeds together. Related by morphology (type), use and genetic heritage. Since the evidence has been published for a good number of years now, and science shows this classification is wrong, the obvious thing to do is to change it. As new evidence comes along, we should revise and correct past mistakes. We are supposed to accept the scientific evidence and facts. We are supposed to tell the truth. The genetic analysis conducted in numerous studies, peer-reviewed, repeated and cross-checked numerous times beyond doubt, has concluded that our breed is not a mastiff. Therefore including it in the mastiff sub-group is wrong. The scientific evidence confirms what the original breed standards were telling us all along – to those that cared enough to study them , at least. I’m surprised that the evidence and the research has gone unnoticed so far, or so it seems, by the FCI. But this error is costly to our breed – the Great Dane is suffering a lot of damage because of this mistake. So the earlier it is redressed, the better. I’m sure the standards commission and the scientific commission will rectify this error as soon as possible. they are not bird dogs – they are hounds of the chase – for big game. What country are you based in ? So, one must presume that the breed Club is each country (if there is one) is responsible for education. And one very fundamental part of education is to explain what was the original function, the one that shaped the breed, as form follows function and dogs are still required to be “Fit for Purpose” even if they are not working. And if there isn’t a National Breed Club to disperse that education then the parent Club of the breed has that duty. That is the area where we have a deficiency – education – and that is the reason we have the type deviations. Because people don’t know – or don’t accept – that concept, of fitness for purpose, or because they have another kind of ‘fitness” in mind. Great Danes were bred to HUNT boar. . . Some still do so today. Others hunt other large game such as deer. But yes the Great Dane was originally bred to be a hunting dog! Ummmm…Duh ? what kind of name is that ? 😀 but you are correct. Hi! I thoroughly enjoy your articles with great illustrations and in depth knowledge, thank you for this blog. I am a plant evolutionary developmental geneticist and we employ the same techniques to map diversity, population structure and phylogenies. The interpretations made here based on the Microsatellite data are farfetched. If you look genetic structure analysis the Great dane Microsatellite genetic structure is the most similar to the Welsh Springer Spaniel, two breeds that have very little in common. Secondly we have the German Shepherd together with mastiff types with the closest match being the Newfoundland and the French Bulldog again breeds that have very few things in common phenotypically. 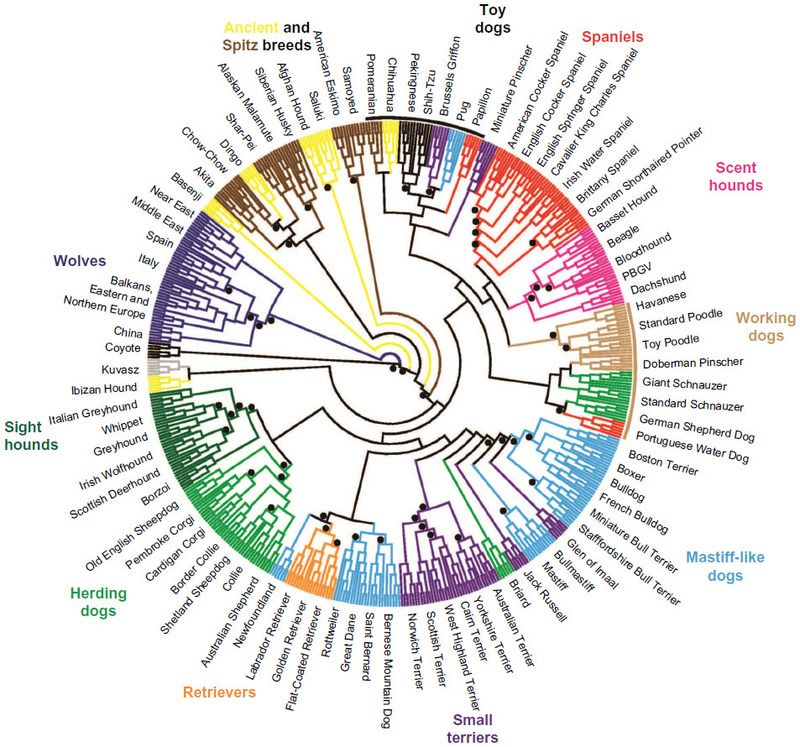 The second image with the phylogeny rooted with the wolves is much more interesting and appealing. Even though diagrammatically the Great dane may be placed right in the centre of the sighthounds on the left and the mastiffs on the right, if you trace back the nodes of the branches you see that great danes along with the St Bernards and Rottweilers share the last common ancestor with the mastiff type breeds than with the sighthounds. Certainly they are no mastiff but genetically they are closer to the mastiff clade than to the sight hound clade. I think that the breed carries more heritage from livestock guardians of the hunting Molossian type (I have alluded to that elsewhere in the blog – see for example here – and I will post more about this) than from true mastiffs. But as you point out and as I also tend to believe these analyses depend very much on the data and on the origin of the samples so as more and more such studies are undertaken and published we hopefully will be able to complete the puzzle with more information. Thank you very much for your comment and your kind words, I am glad you are enjoying the blog, thanks for following ! So according to this article absolutely no Mastiff(s) were used in creating the Great Dane by the early German Breeders? I don’t believe it and it would mean every Great Dane book I’ve ever read was incorrect. I don’t understand your dislike of “Mastiffs” to the point where you completely deny the breed was ever used along w/ other breeds to create the Great Dane. You’re so anti anything Mastiff associated w/ Great Danes it’s actually comical! did you even bother to read the many posts about the history of the breed in this blog ? The question is rhetorical – you obviously did not. Second – the issue is not if mastiffs contributed to the development of the Great Dane or not – you seem to have difficulty in comprehension. The Great Dane breed is according to the original standards “neither a mastiff nor a greyhound”. The only thing this article proves is that hunting dogs along w/ Mastiffs were used to create Great Danes but not that Mastiffs weren’t used at all. Fact: If a mastiff and a saluki have babies – the progeny is neither a mastiff nor a saluki. True, and this is why in their country of origin they’re correctly called Deutsch Dogge – German Mastiff (not German Hound). A Great Dane aka. German Mastiff is neither a lumbering Mastiff nor a sleek, fast Hound.